Villa 10min walking distance from Pto. 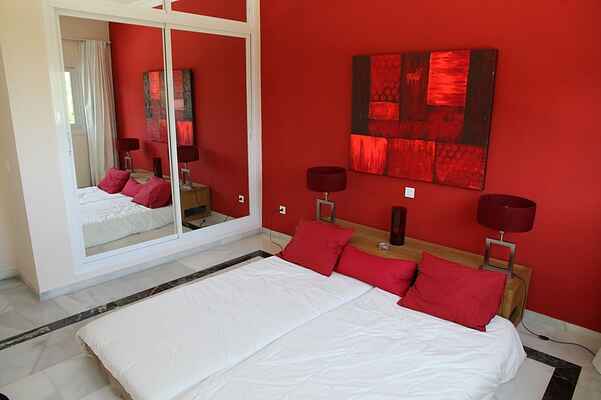 Banus, gated secure, flower garden, lawn, two terraces and huge balcony overlooking La Concha mountain. Enjoy ocean view from Puerto Banus to North Africa, on 1.700 mts well fenced plot. Sun all day, with shade, sun shades, sun loungers, outdoor dining opens to indoor dining. Swimming pool, BBq area. Interior space of 350 mts with 4 bedrooms, 2-Bedrooms upstairs with single beds and 2-Bedrooms downstairs with double beds, all bedrooms en suite with either bath or power shower rooms, Kitchen, Dining Area, Living room A delightful house built on a hill, not overlooked, no passing traffic, no road noise, just peace and the sound of birds.. There is plenty of room for 8 adult friends, family groups, plus toddlers in cots. Drive or use excellent taxis.